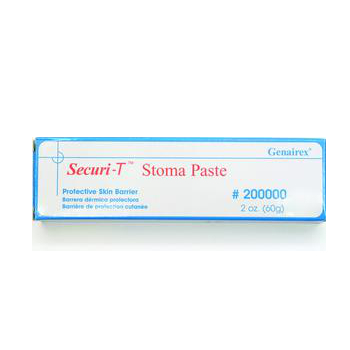 The Genairex Securi-T™ Stoma Paste is a pectin-based paste helps prevent skin irritation and stoma leakage when used as a "caulk" to fill in uneven skin surfaces on the stoma where the ostomy appliance is attached. Use on healed, healthy stomas to maintain skin wellness and prevent leakage. Contains alcohol.